Ghosts are real, that much I know. On paper Crimson Peak sounded like the perfect fitting. Guilermo Del Toro the master behind such films as Pan’s Labyrinth, Hellboy and The Devil’s Backbone bringing a haunted ghost story that looked as though it could have been taken straight out of 1960’s hammer horror to life in the modern age. Although it does end up being some of those things, they are all decoration for what the meat of this tale actually is, a twisted gothic romance. The first half of the movie plays out like something out of a Jane Austin novel (if Jane Austin novels had free roaming spirits in them) where an outsider British man named Thomas Sharpe (Tom Hiddleston) comes to New York in an attempt to sell his invention for digging up clay to some rich investors. Right away he catches the eye and charms the pantaloons off the young and beautiful Edith Cushing (Mia Wasikowska) who happens to have a rich and respected father. Their relationship booms and it’s not long before she is swept away back to the isolated castle with her new husband. In all of this however there is Lucille Sharpe (Jessica Chastain) the sister of Thomas who lurks in the background and allows viewers to know that something is not quite what it seems with both her and her brother. Obviously the strongest aspect of Crimson Peak is in the set and costume design which is perhaps some of the best I’ve ever seen. The deteriorating castle that creaks and whistles with every gust of wind, slowly sinking into its clay foundation feels alive and becomes a character in itself. The flamboyant dresses and perfectly tailored suits fit the time period perfectly with just the slightest hint of gothic flair. It’s no surprise however, as Del Toro never disappoints when it comes to the look of his films, and it is becoming quite clear what makes a Del Toro film just that. Though there are ghost that haunt the hallways and bathrooms of the mansion they play a minor role in the overall film, less and less as the film progresses. The moments when they do show up however are tense, and their grotesque appearance feels very fitting despite them being completely digitally made. 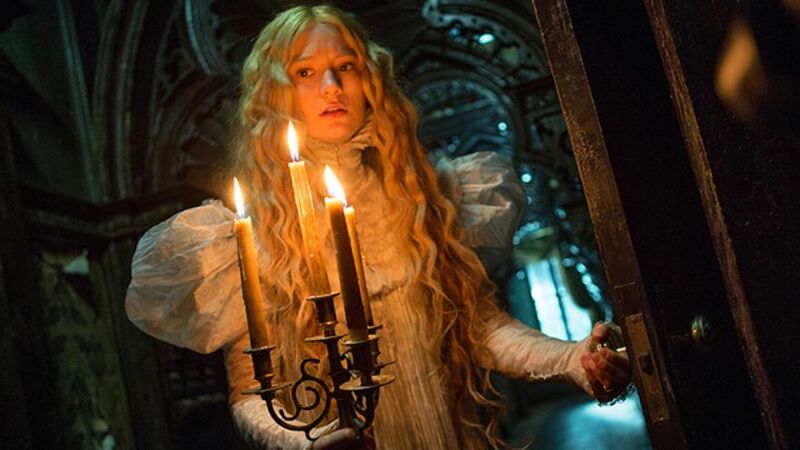 Everything we’ve come to expect from Del Toro can be found in Crimson Peak. The incredible design of both the world and the creatures. The brisk aggressive violence that attacks like a startled rattle snake without notice. Cinematography that paints a picture that is consistently beautiful and surreal, setting it almost over the edge onto foolish but not quite. For me this was a comeback film for Guillermo Del Toro, a recovery from the mega blockbuster studio failure that was Pacific Rim. Although I did enjoy moments of that movie it never really felt like a Del Toro movie, as though his vision was being held back (most likely by Universal). Crimson Peak is the complete opposite of that, it’s the director bringing his full creative vision to life allowing us to spend two hours in his weird and twisted gothic fairytale. Because looking past the obvious inspiration from 1960’s hammer horror and gothic romances found in the pages of writers such as Bram Stroker, and looking past the nods and tips of the hat to genre classics such as Kubrick’s The Shining and Hitchcock’s Notorious, that’s what Crimson Peak ultimately is, a simplistic gothic fairytale.